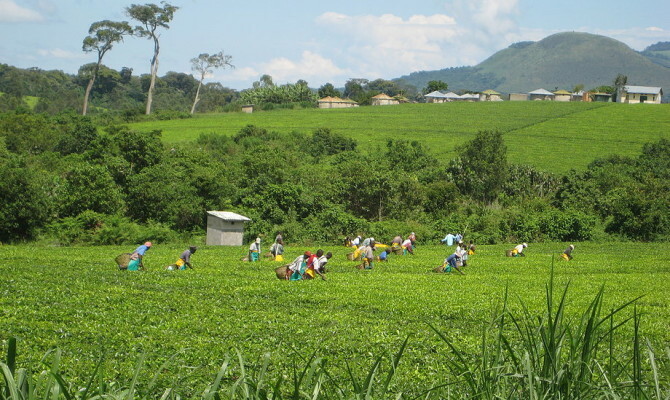 BUSHENYI- The rift between the tea farmers under Igara Tea Growers factory limited and their board of directors has continued to widen with the former accusing the latter of mal-administration, failure to step down after their tenure of office elapsed and cutting down tea prices. Igara tea factory located in Bushenyi district is one of the leading tea producers in Uganda which has over 6000 farmers from districts of Buhweju, Sheema, and Rubirizi. The row at Igara tea growers stems back in 2010 since farmers have been questioning the manner in which the company is being run with various audit queries. Matters worsened when their tenure of office expired last year in August when a serious row erupted since they are mandated to serve for only six years. In a meeting that was held at multipurpose hall in Bushenyi town over the weekend was attended by among others former minister Tarsis Kabwegyere, former MP Buhweju Ephraim Biraro, Igara MP Raphael Magyezi and Bushenyi district chairperson Jaffar Basajabalaba. Tea Farmers made numerous resolutions among which is to suspend the constitution of the company which was illegally adopted by an illegal board, having a proper audit ever since farmers started raising their concerns, to terminate the board of directors in the next Annual General meeting and appoint new board members, ensure that zonal meetings are properly conducted aiming at involving all members and amending the agenda for the AGM, preparing documents to sue the board members in courts of law without forgetting to seek appointment with the president Yoweri Museveni. Other resolutions were to invite the registrar general of companies to chair the next AGM as per the letter he wrote extending the meeting to November 23. A section of political leaders from greater Bushenyi who had attended the meeting expressed their worry that the ongoing bickering might pull down the factory. Jaffar Basajabalaba, the LCV chairman for Bushenyi district said it’s very unfortunate that a company whose majority of households derives their livelihood is threatened as if there is no rule of law. “I have represented my colleague LCV chairpersons from this region, we are going to sit down and see this infighting stops, there is rule of law and we can’t allow this insanity to prevail,” said Mr Basabalaba. We have learnt that previous tea farmers had petitioned the Uganda Registrar services bureau to intervene into the matter on how they can be resolved. In response URSB registrar General Silverio Mwesigwa’s letter dated October 16, 2018, addressed to directors Igara Growers Tea Factory Limited acknowledges the petition that had scheduled to hold the meeting on 17th October 2018, but was rescheduled after receiving the communication from the chairman board Gershom Rwakasanga Kateera requesting the meeting to be referred to another date since he was not going to be present. In the letter, Mwesigwa further advised that the current board should desist from carrying out any action/transaction that may be prejudice the current status of the company by way of resolution from the time the complaint was lodged up to when the issues raised are solved. The names of four members out of eight are wanted to step down, and these include Eng. Gershom Rwakasanga (Chairman) Edson Musiime Batuma(director) Daniel Nareeba (director) and Eldard Muhangisa( director), they say these are not eligible to stand again. Ronald Rwakangi who was one of the lead petitioners told the meeting that a lot of fishy moves have been orchestrated by the board including cutting tea prices from shs600 per kilogram to shs470, he adds that without the resolution of the AGM, they have been siphoning company’s money to construct another factory of Kanuka Factory. “We are not certain about the future of our factory, we are so suspicious why these people don’t want to leave the seat, but we are putting all our efforts together to see these people out of office, because they failed to adhare to the directive from URSB and they continued using company money to carry out transactions. Some farmer argued that before the AGM on November, these four directors led by Gershom Rwakasanga should be out of office, “otherwise we shall reach there, these guys we chair the meeting and have their ideas passed, we cannot seat when these people are still in office. Raphael Magyezi Mp for Igara west who had also attended the meeting told new vision that the purpose of the meeting to consult farmers, stakeholders on the management issues and failure by board to step down. He said that they set up a team to meet the board and agree on the agenda of the AGM specifically to include elections for new board. “If they fail to agree with the team we have set the remaining option is to take the matters to government because articles of association allow members to elect their leaders of their choice” Said Magyezi. Onesmus Matsiko, the General Manager Igara Growers Tea Company admitted that its true there are issues between the board and some shareholders mainly on leadership but maintained as management they are working professionally to see this does not affect the operations of the company. He said an Annual General Meeting (AGM) has been called on Nov 23rd, 2018, which he says he is optimistic will, sort of some of the grievances that have cropped up in the recent past. Gershom Rwakasanga the chairman board, when contacted for a comment, said that he cannot discuss matters of company in the press.